Updated Sunday, Jan. 14, 2017, 9:15 a.m. EST: H&M has decided to temporarily close all of its stores in South Africa amid protests that have seen several of its stores ransacked by protesters upset at a recent racist ad. CNN reports that H&M has 17 locations in South Africa. “We continue to monitor the situation closely and will open the stores as soon as the situation is safe again,” read a press release. 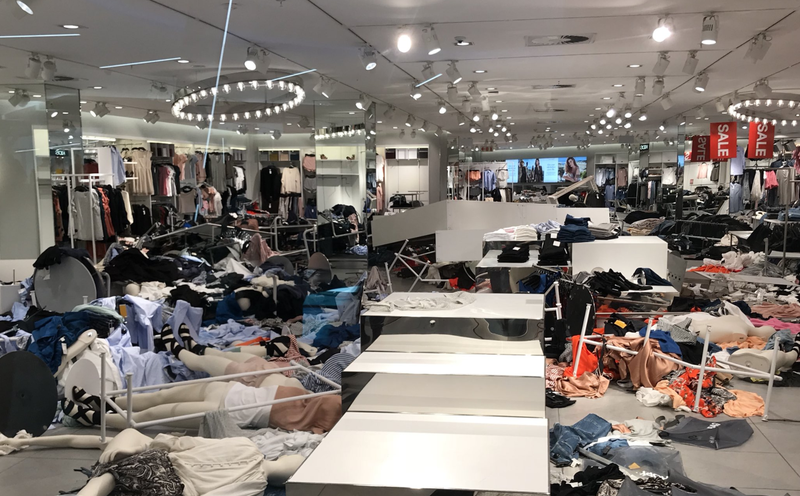 Several H&M stores in South Africa caught wreck after protesters tore up several of the cheap-chic outlets on Saturday. They have reportedly said that they will continue to protest the retailer “indefinitely” until the stores close permanently. The outlet reports that at one of the six stores targeted, officers fired rubber bullets to disperse the protesters, but police so far have made no arrests. Earlier this week, H&M issued an apology for the widely criticized ad, but protesters said that this is only the beginning. One Twitter user quoted an EFF member saying that the group had given the store at one mall 24 hours to close its doors permanently, or protests would continue outside it indefinitely. The group obviously has different plans to upend the cycle of corporate racism, which is outrage, apology, business as usual, rinse and repeat.